Dimensions: 45" x 35" x 35"
Dimensions: 45" x 24" x 24"
Dimensions: 36" x 22" x 48"
Dimensions: 36" x 22" x 60"
Dimensions: 36" x 22" x 72"
Special Cases round out your displays with these special cases. They will fit your specific need in your store. Don't see it on our website? Please call us 1-800-426-5708 so we can make one just for your store. 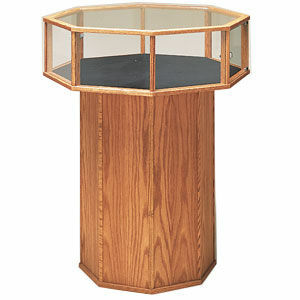 Octagon Feature Display Case - The classic design of this wood and glass display case will attract immediate attention to your special products such as jewelry and collectibles in your retail store or gift shop. FOB - Bend, OR Unless noted ALL cases will ship VIA LTL Common Carrier. A crating charge will be added to all cases being shipped. You will be notified of the freight amount and the crating charges.